I really love the Décor Excel II 5024 because of it's large choice of 24 stitches and automatic one-step buttonhole. It's smart features, recommended via the Message Guide on the stitch panel, will suggest the appropriate tension, stitch width and stitch length for each stitch. You'll find yourself saving time thanks to the auto-declutch bobbin winder, the built-in thread cutter and needle-threader, and snap-on feet. The 5024 also includes a drop feed facility. Apart from the core sewing itself, the extension table serves as a practical storage compartment which doesn't get in the way of free-arm sewing. There are a wide range of feet available for this machine which are stored under the flip top lid. A hard cover is included for protection of the machine. 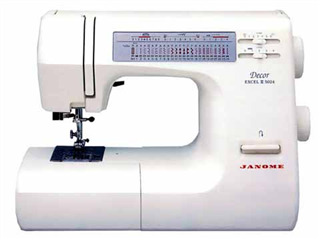 Machine also comes with many standard accessories such as adjustable Blind Hem Foot G, Overedge Foot C, Quilting Bar, Lint Brush and many more. Please call to know the extent of accessories as well as more information.